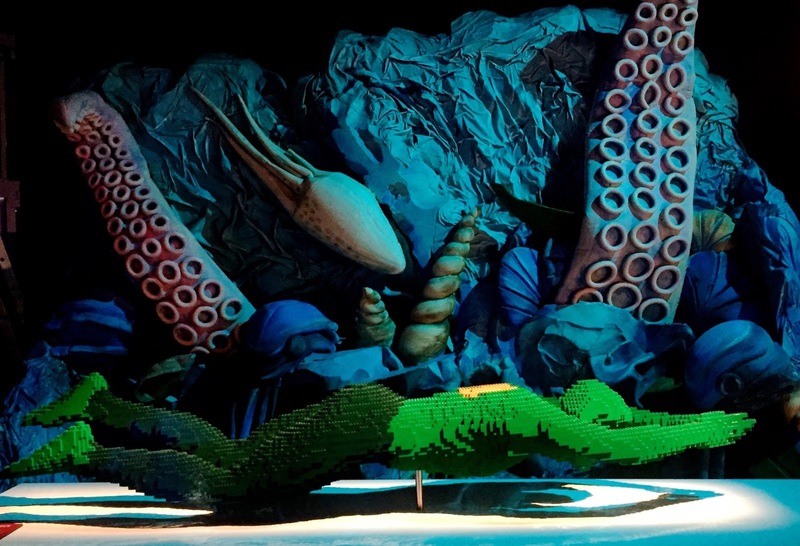 A few years ago I was positively blown away by something a friend recommended to me called Art of the Brick by Nathan Sawaya, a former lawyer who took his passion for LEGO and turned it into a thoughtful, fascinating and must-see exhibition. I was blown away... 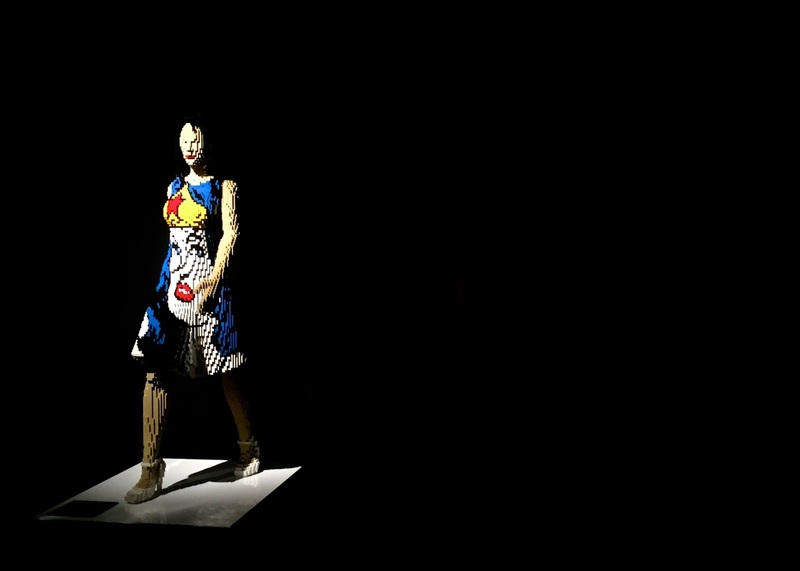 I had no idea how moving and impressive a LEGO art exhibit could be, but it was one of the coolest things I'd ever seen. 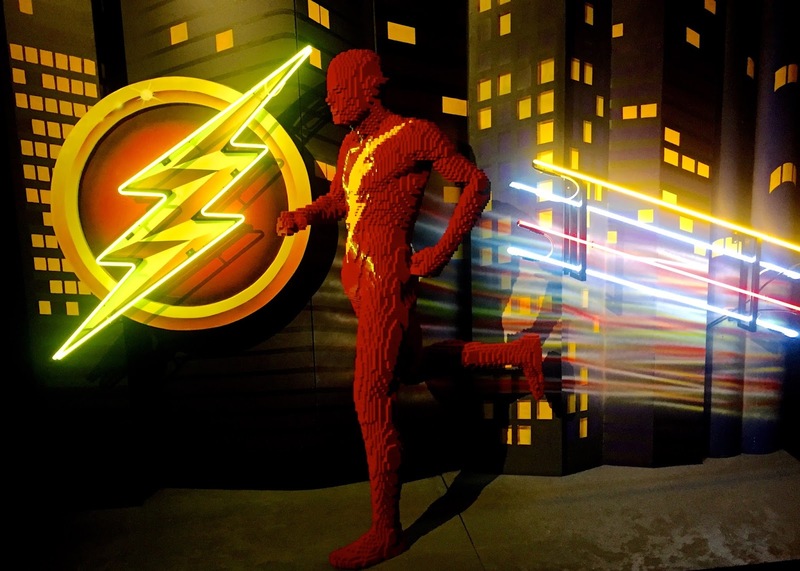 Fast forward 3 years and Nathan Sawaya has gone back to the LEGO box, partnering with Warner Bros. Consumer Products and DC Entertainment to bring Art of the Brick: DC Super Heroes to London. Thoughtful, beautifully laid out, colourful and wildly entertaining, it's a must-see for both Londoners and visitors to our fair city this Spring and Summer. Whether your preference is for super heroes, super villains or a healthy mixture of both, there's plenty to see and I'm sure all your favourites will be there from Batman and The Joker to The Green Lantern and Wonder Woman. 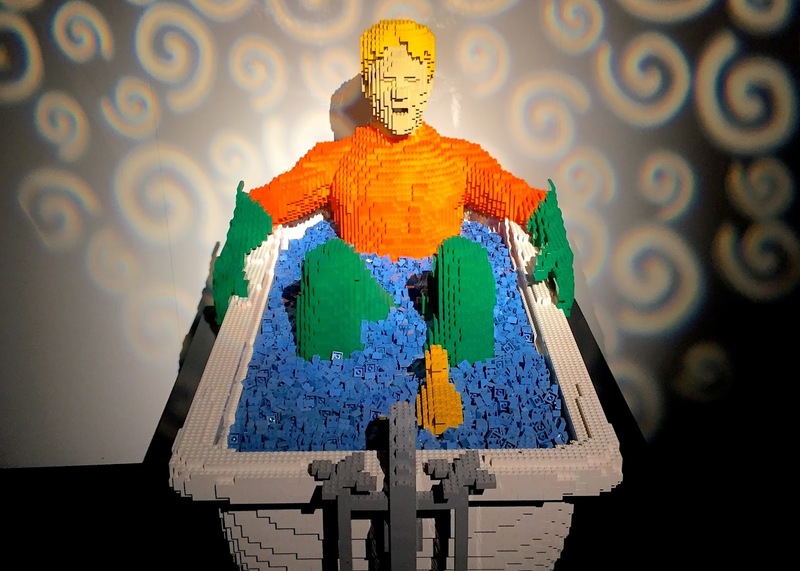 With over 120 works of art made out of nearly 2 million LEGO bricks, Art of the Brick: DC Super Heroes features large-scale sculptures of all your favourites including Superman, The Flash, Harley Quinn, The Riddler, Aquaman, Cyborg and many more. The grand finale is a life-size replica of the Batmobile, tucked away in a recreation of the Bat Cave - it's certainly something to see! 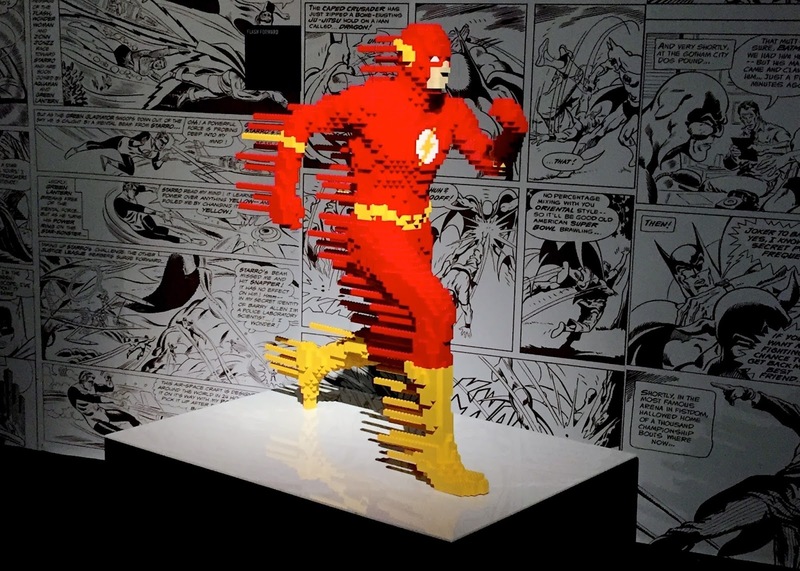 Nathan Sawaya isn't just your average guy who likes LEGO and he doesn't simply recreate images of super heroes. He builds massive works of art, has a unique vision and recreates his own inspired interpretations. In this particular exhibition, he focuses on themes found through the DC Super Heroes mythology like transformation, reinvention, strength & weakness and good vs. evil. Throughout the exhibition there are quotes on the walls, many of them from Joseph Campbell's The Power of Myth while others are from DC Comics or the artist himself. My favourite part of the exhibition is a sculpture of a small boy with a colourful cape... It represents the child in all of us and the potential super hero inside. With a few quotes on the wall from the artist as well as a mirrored sculpture, it's a reminder that we are, as people, capable of heroism. We don't require capes and super powers to be heroes - we can make choices every day that make us individual forces for good. "Of all people, you know who I am... Who the world needs me to be. I'm Wonder Woman." There's no shortage of female representation in Art of the Brick: DC Super Heroes with the ladies making a splash throughout the exhibition. If I'm honest, I didn't recognize half of them, but all the well-known ones are there including Wonder Woman, Harley Quinn, Super Girl, Bat Girl, Catwoman and so many more that I can't name. Diana Prince: In Disguise (pictured above) was one of my favourite sculptures, featuring the character wearing a dress with Wonder Woman on it. 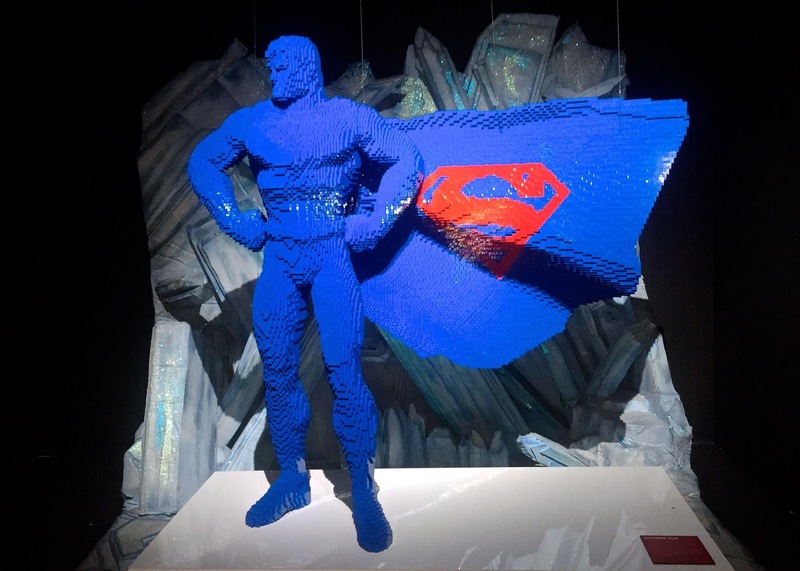 Art of the Brick: DC Super Heroes has just launched in London and will be here throughout the summer, housed in a colourful temporary structure erected on the South Bank adorned with bright comic book imagery that's hard to miss. Inside the walls are decorated with comic book wallpaper and walking through the displays offers one surprise after another with the room being dark except to light the works by the artist. The exhibition begins with the joker sitting in what looks like an interview chair with the other chair empty for photo opportunities. 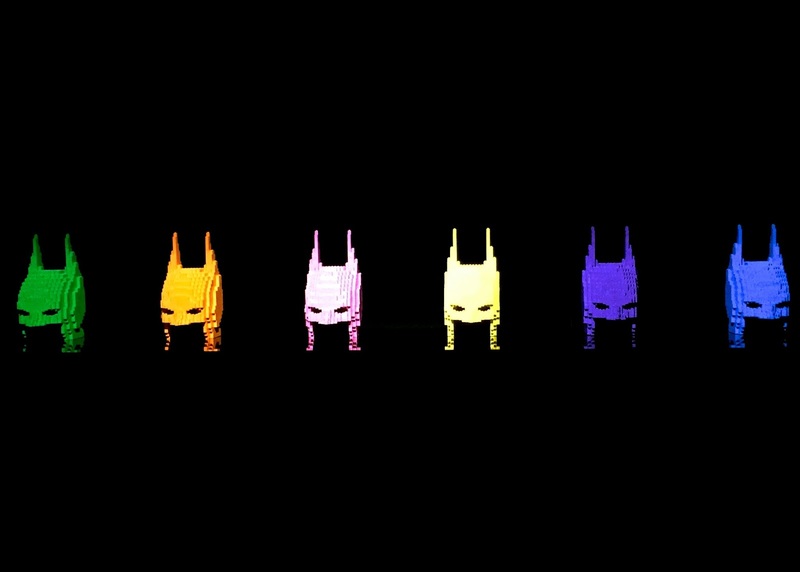 Visitors then head into a dark room to watch an introduction video and following that, enter a world of LEGO heroes and villians with one sculpture being more impressive than the one before. "We are responsible for each other. That's part of being human -- isn't it?" The exhibition is thematically designed with each room exploring a different aspect of DC Comics and heroism in a way that is really quite timely with what's going on in the world today. 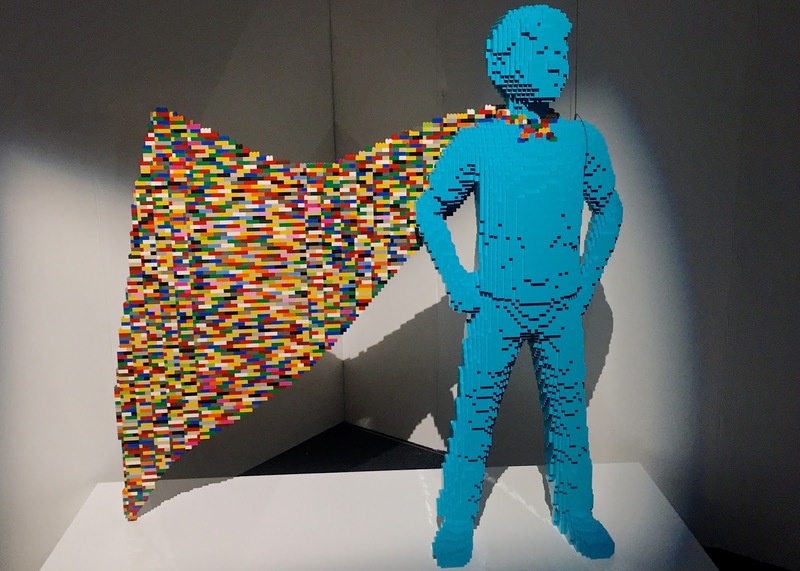 With the news generally being quite negative day-to-day and the political divisions in the US, the UK, Europe and elsewhere, it's not surprising that Nathan Sawaya has used LEGO to bring to life something that always comes in handy in times of struggle and need... Heroes. He uses comic books to subtly remind us of what we learned from cartoons as children about our duties to society and humanity - what it means to be one of the good guys or gals. Furthermore, we all know that heroes would be out of a job without villains and Sawaya gently reminds us of that too with this exhibition, which is a comfort, but also a reminder that there will always be bad forces but in the end, good always trumps evil. In the interest of keeping things honest, I'll admit that I'm neither a fan of comics nor LEGO, but I love Art of the Brick: DC Super Heroes. I don't need to read comic books or play with building blocks to appreciate the craftsmanship and theatricality of Nathan Sawaya's creations. While there were many heroes & villains I didn't recognize, there were plenty of sculptures of characters everyone is sure to recall like Superman or Batman and the exploration of hero themes is enough to keep anyone intrigued, entertained and interested. 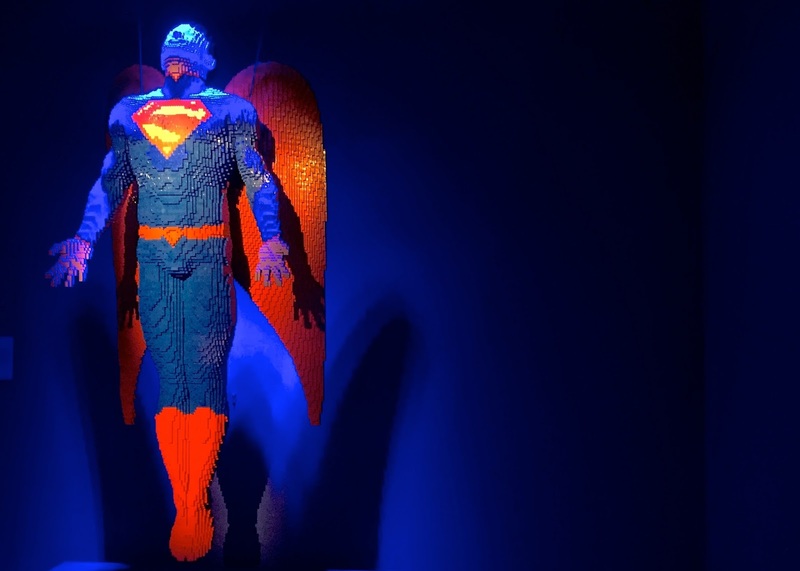 Art of the Brick: DC Super Heroes features incredible lighting, creative backgrounds & displays and is more centrally located than Nathan Sawaya's previous exhibition in London. I highly recommend it whether you're a visitor to London or a local - it's fun, unique and it's not every day that one can see a life sized Batmobile created entirely out of LEGO. 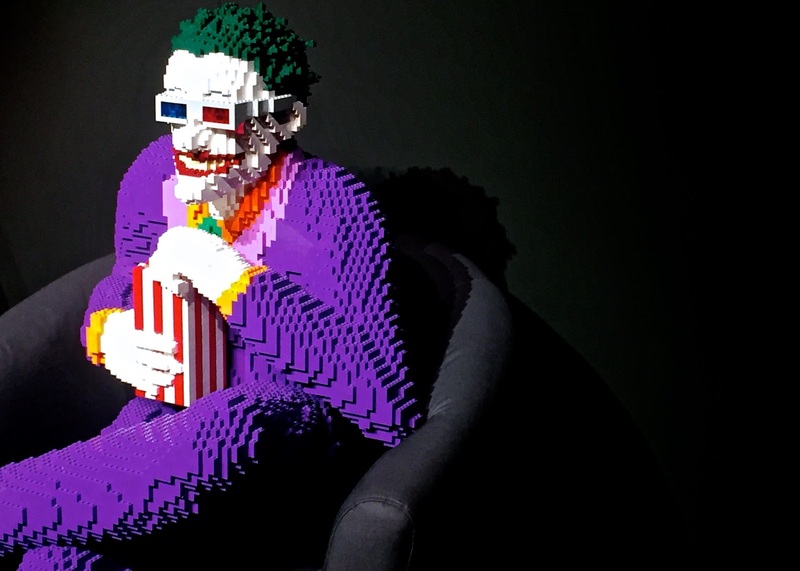 Art of the Brick: DC Super Heroes is located at South Bank, just steps away from Waterloo Station in a purpose-built tent at Doon Street Car Park located next to the Green Room, directly behind the National Theatre and the BFI. For anyone visiting London and looking to plan a day at South Bank, other nearby attractions include the Coca-Cola London Eye, Sea Life London Aquarium and the London Dungeon. Big Ben, the Houses of Parliament and the West End are also just a short walk away as is Covent Garden. There are several nearby restaurants including Wahaca, Wagamama, Black & Blue and many others, so it's easy to spend a day there. 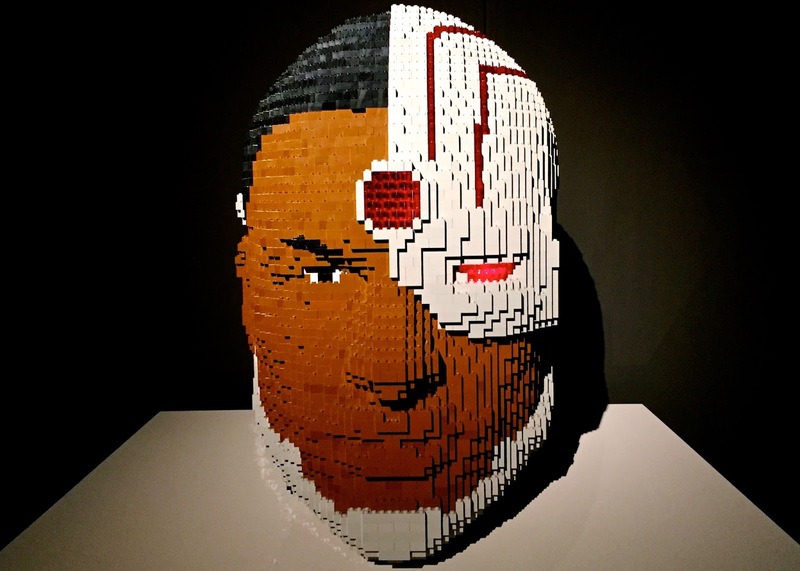 Art of the Brick: DC Super Heroes is open daily and currently booking through the summer to September 3rd. The last admission is one hour before closing. 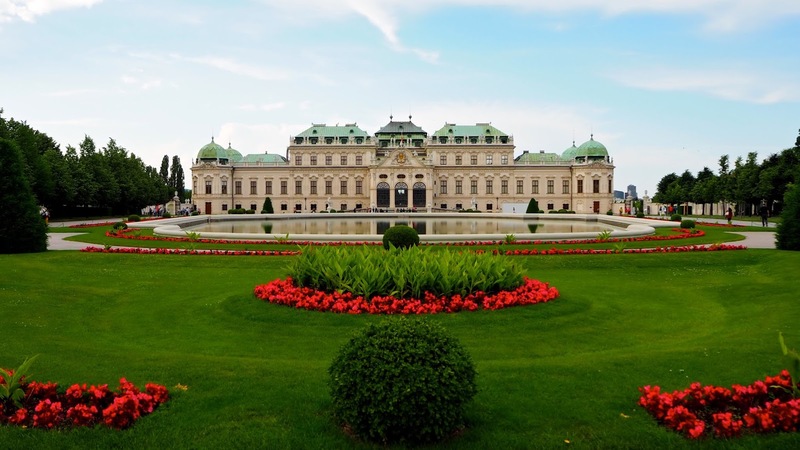 The exhibition can easily be seen in an hour, but you may want to give yourself 1 1/2 to 2 hours in case it's crowded or if you'd like to spend plenty of time there to read all of the signage and really experience everything. Tickets are £16.50 for adults, £11 for children aged 4-6 years old and kids under 4 go free. There are concession tickets at £12.50 for those who qualify as well as family and group options. All tickets on Mondays are £10, so if you're on a budget, be sure to plan your trip on a Monday. For more information or to buy tickets, visit aotbdc.co.uk. Review opportunity provided by Art of the Brick: DC Super Heroes. All thoughts and opinions here are my own and in no way influenced by Art of the Brick: DC Super Heroes or any of its partners.